Click HERE and send us your e-mail address to be added to our mailing list! Click HERE to find out about joining the official Ten With Strangers street team!!! Thanks to the estimated 1500 people who came out to Joe's on Weed St. last night! It was crazy!!! We will update you when new shows are scheduled. Tonight was our second live performance/interview on 95.1 FM WIIL Rock. Happy New Year! Click HERE to listen to our interview on WKRS (see below). 5 to 6 PM on the debut of the local music show on WKRS 1220 AM (sister station to 102.3 FM WXLC). We'll be talking everything TWS and spinning some clips from our new CD with the hosts! "Cavity" debuted on 94.7 FM The Zone today! We will be releasing a new bigger, badder, and better version of our CD "Infectious" on Nov. 26th! It will feature two new songs and improved versions of many of the others. 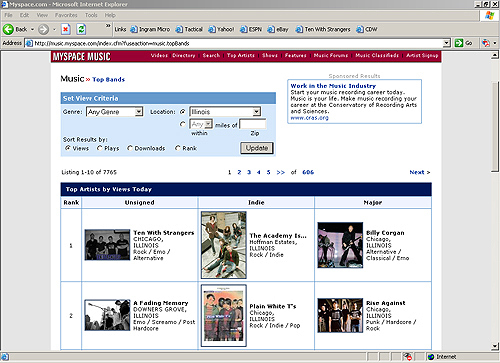 Samples of all songs from the CD are available on the MUSIC page. "Overdose" from the upcoming revised CD debuted on 94.7 FM The Zone today! "Wreck" from the new CD debuted on 94.7 FM The Zone today! We'll be opening for SPONGE on July 16th! "Slave" from the new CD debuted on 94.7 FM The Zone today! Long-awaited debut CD "Infectious" to be released on June 25th! Not from Chicagoland? You can pre-order the CD to be shipped to you starting today - click HERE for ordering details! Tonight was our live in-studio performance and interview on 95.1 WIIL Rock! You can listen to the interview portion by clicking HERE. We have been selected by 94.7 FM The Zone as one of the "Next Big Thing 2" finalists!!! We have been selected by Paramount Pictures to compete in their "School of Rock" competition!!! Click HERE for details! Also, the first review of our demo CD has been posted on Chicagogigs.com. Click HERE to see the review! "One More Chance" and "A Better Place" from our new CD are being played on 95.1 FM WIIL Rock!!! Keep tuning in on Sunday nights between 7-9 PM to hear us! Peak position on myspace: ***NUMBER ONE*** unsigned artist in Illinois! Click HERE to see for yourself! Keep spreading the word - let's stay at the top! 06/22/09Ten With Strangers songs are now available for download on iTunes, Amazon.com, Napster and more! Click HERE for details!